TRAP NAMES: Long Spring #16 Bear Trap and Long Spring #6 Bear Trap. 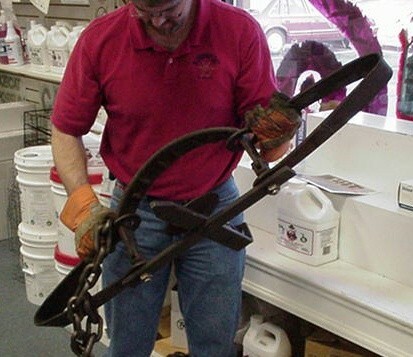 TRAP DESCRIPTION: Originally used for large animals like black bear, brown bear, polar bear, grizzly bear, asian bear and kodiak bear, these traps are now outlawed but still used for demonstrations and decorative applications. They are still fully functional and ready for use. Pictured to the right up top is the #16 Long Spring in the "offset" design. This model features the "teeth" most people think of when they see a trap of this design. 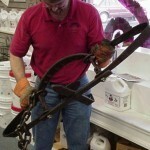 Weighing in at 43 lbs, this trap measures over 42" long and comes with the heavy link chain attached. Its suitable for bear, lions and basically any large pawed animal where you need a jaw spread of 16 inches. A little further down the page is the #6 Long Spring. This trap is the same size in weight and length but is lacking the teeth. The Jaws of this model will seal tight when closed. Like the #16, the #6 is fully functional and ready for use afield. To set either trap, review the video below. 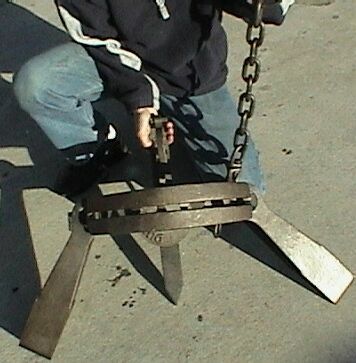 Generally it can be done with a pair of strong C-Clamps. Good day to you; what a super site this is! Just one little question, can you deliver to the UK and how much in total with shipping etc. for an 825056? Mind you I have to ask my girl friend before I order one !!!!!!!!!!!!!!!!!! We ship these abroad all the time. To see what shipping will cost, you'll need to click the link above that reads "International Customers Order Here". Once on that page, simply click the button that reads "add to cart" the trap model you want and then click the "view cart" to check out. On that page you'll be asked to enter your country and maybe even a postal code (before any payment info is taken). Our site will then calculate freight and you'll see real time what shipping will cost so you can decide if you still want to order.